In 2015, Rev. 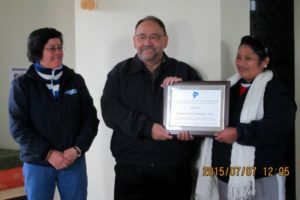 P. Jerry Bennett accepted a plaque from FEDICE commemorating the support Illinois South Conference had given them as part of the Ecuador Partnership. Jerry (center) took part in the five-year evaluation of the partnership. 2015 completed the 15th year of the partnership with Illinois South Conference. Presenting the plaque are Blanca Puma (left) and Digna Chacha, representing FEDICE.